Engraved map by Pierre Husson. 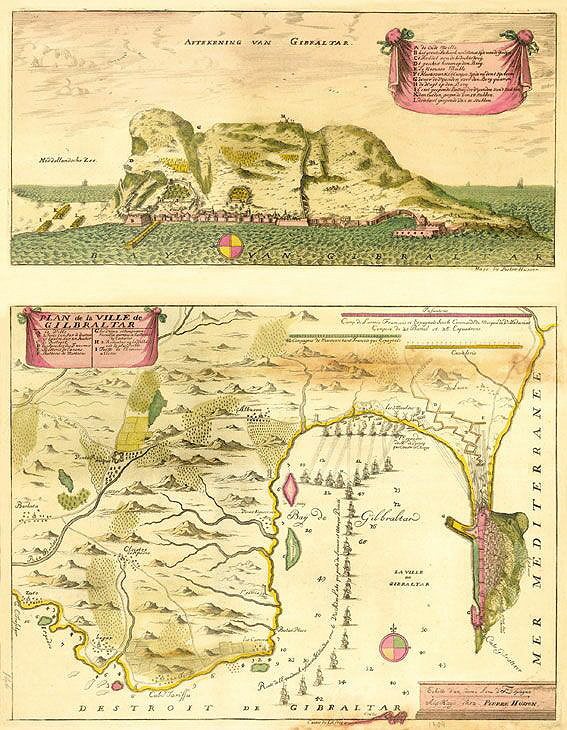 This plan of Gibraltar, with its view of the fortress, is of particular interest because it was produced shortly after the combined British and Dutch forces seized the Rock on the 24th of July, 1704, during one of the actions of the War of the Spanish Succession. The movements of the fleets are indicated on the map. Although the British and the Dutch were allied in the battle, the British Admiral, Sir George Rooke, took possession of Gibraltar in the name of Queen Anne, whose government ratified the occupation. During the whole of the 18th century numerous attempts were made by the Spanish to regain possession, but they all failed. This, despite the Treaty of Utrecht of 1713 (one of the series of treaties which ended the War of the Spanish Succession) by which Spain ceded Gibraltar to England. The Treaty of Utrecht, as a result of the War, was one of the most important treaties in British history, and contributed greatly to the expansion of the British empire. From Husson’s Diverses Cartes de Geographie, où l’on peut voir la Theatre de la Guerre dans tout le Monde. From the collection of the Tangier American Legation Museum (Morocco), M338. 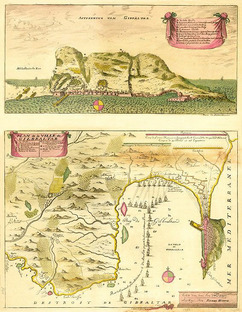 "Plan de la ville de Gilbraltar [sic]... Aftekening van Gibraltar," online in Digital Library for International Research Archive, Item #4, http://dlir.org/archive/items/show/4 (accessed April 21, 2019).